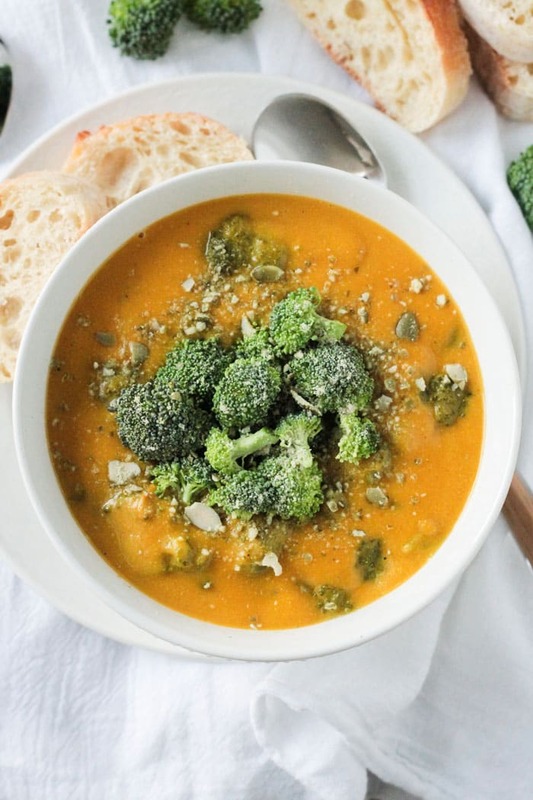 Vegan Broccoli Cheese Soup – super creamy, “cheesy” broccoli soup made from whole food ingredients. No fake processed cheese!! Oil free and gluten free too! My Butternut Squash Mac and Cheese is one of the most popular recipes on my blog (only one recipe is loved more and that’s my Buffalo Cauliflower Bites). It’s popular for a good reason – it’s AMAZING! Seriously the BEST vegan mac and cheese I’ve ever had…and so many of you agree. I figured that if butternut squash makes great mac and cheese, then it should also make great cheesy soup. I tweaked my Butternut Mac sauce just a bit to lend itself more to a soup base and it worked out so well. You could probably drink the stuff, but I haven’t tried that…yet. 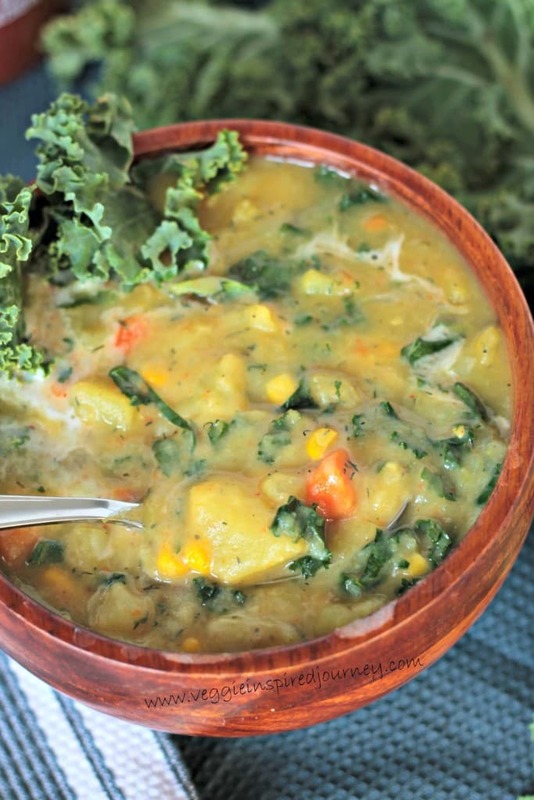 The best part about this cheesy vegan soup is that it’s made from real whole foods. No fake processed cheese! The combo of yukon gold potatoes, butternut squash, sweet onion, pumpkin seeds and some spices combine to make a truly cheesy flavor. I also added some nutritional yeast to the mix. I’m actually not a huge fan of sauces that rely on “nooch” for their cheesy flavor. I’ve used it here just as enhancement to the flavor, not the main part. You could even leave it out if you don’t want to use it or can’t find it. (Do NOT substitute any other kind of yeast!). 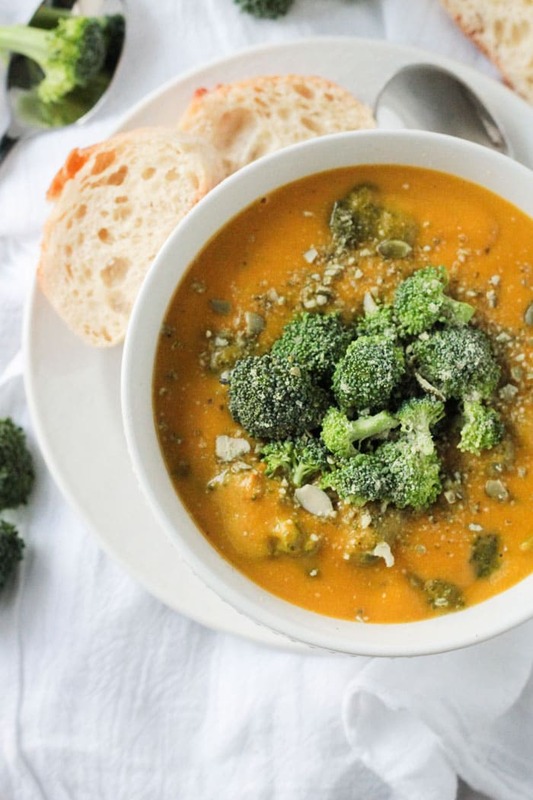 I hope you love this Vegan Broccoli Cheese Soup as much as we do. If you give it a try, please come back and leave me a comment below with your feedback and star rating. You can also find me on social media, so snap a quick pic and be sure to tag @veggie_inspired and #veggieinspired so I’m sure to see it. Enjoy! Vegan Broccoli Cheese Soup - super creamy, "cheesy" broccoli soup made from whole food ingredients. No fake processed cheese!! Oil free and gluten free too! Place the potatoes, butternut squash, onion and broth in a medium size pot on the stove. Bring to a boil, turn down the heat and simmer for about 15 minutes until the veggies are tender. Transfer the potato/squash mixture to a high speed blender. Add the pumpkin seeds, lemon juice, apple cider vinegar, mustard powder, turmeric, nutmeg, salt/pepper, and nutritional yeast if using. Blend until smooth. Transfer back to the pot over medium heat. Add the chopped broccoli. Cover the pot and simmer for another 10-15 minutes until the broccoli is tender. If you like your soup thinner, you can add a little unsweetened cashew or almond milk at the end and heat through. Is the consistency such that it might work for a fondue? Or would it need to be thickened up? Sorry if this seems like a silly question, but where the recipe says to transfer the potato/squash mix to a blender, does that include the cooking broth or just the veggies? I’m guessing veggies AND broth but I’d like to be certain. Thank you. Love it – really delicious. My 12 year old son and husband, who are not vegan, loved it as well. Yay, that’s great, Cathy! Thank you so much for making it and stopping by to share your results! Thanks, Kat! I don’t know the nutrition facts off the top of my head, but there are a number of free online nutrition counters, such as nutritiondata.com or myfitnesspal.com. Just input the ingredient list and it should give you a rough idea. It is very hard to find a healthy meal that the entire family genuinely enjoys. I took a chance on this knowing we (the entire family) are not big fans of squash. And i am SOOOOO glad i did. We all seriously love this. My 5 year old said it’s his new favorite dinner. My two year old actually SAT down and ate it quietly… like what? this never happens. I am super impressed with this soup! thank you!! Cannot wait to make it again…. and next time it will be doubled! Oh, Shir, this makes me so happy!! 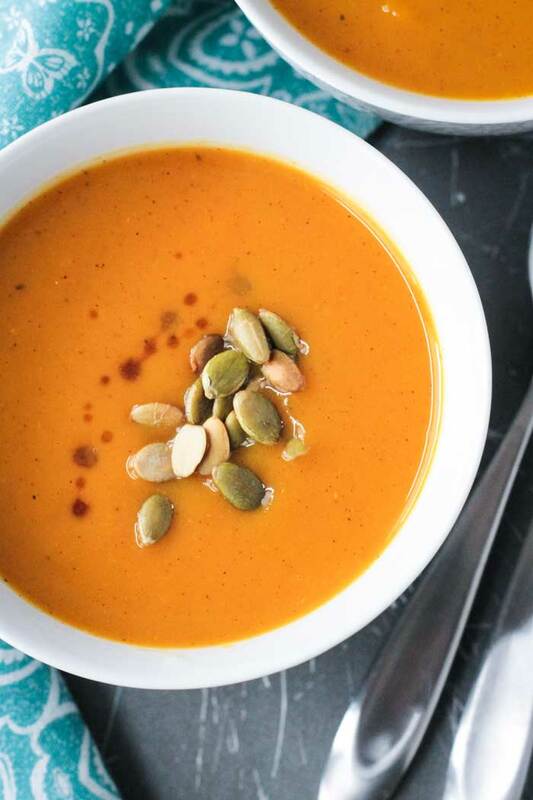 My son doesn’t particularly like squash either if I just roast it, but he loves this soup and he loves the Butternut Mac I make with it too. Thank you so much for stopping by to leave your feedback. I really appreciate it. Enjoy the rest of your week! tried this tonite. it was absolutely delicious. i sub the broccoli for cauliflower as that’s all i have. will make this again thank you for sharing this recipe. Thank you, Pauline! I’ve been meaning to make a cauliflower soup too…good to know it works just as well in this one. Happy New Year!! Thanks, Melissa. Me too. Definite comfort food! This looks so good! Those colors! My kids love broccoli so I think they might go for this. And I love that it’s all whole ingredients. We are in full on soup season here—supposed to have record breaking cold temps this week so I will put these ingredients on my grocery list! Us too! They are saying 50 below with the windchill. Yikes! Soups on for sure! This looks amazing! Any swap ideas for the pumpkin seeds? Not something I can find locally. Thanks, Melissa! You can use 1/4 cup of cashews. I find the pumpkin seeds to have a “cheesy” flavor to them but cashews will work just fine too. I hope you enjoy! Looks divine! We live in the Canadian sub-Arctic and we love our soups! We have some of our own homegrown russet potatoes; would there be much of a difference using them as opposed to Yukon Gold? Hi, Sandi. I find Yukon Golds to be the creamiest, but I’m sure it would work just fine with russet too. Let me know how it turns out. Thanks! It looks so thick and creamy. My kind of soup! I love all of the healthy ingredients you have packed into it too. It looks like a great one for getting kiddos to eat well without realizing! Exactly! My kids gobbled it up! This is my favorite kinda of soup! I love how many veggies you’ve packed into your recipe. Thanks, Dianne! Definitely not your traditional cheesy soup! …do you think this soup is freezable…that is IF there are anything leftovers !! Hmmm, that’s a good question, Jill. I’m not sure. I would be afraid the broccoli might get mushy. I don’t see why the soup base itself wouldn’t freeze though. You might need to add a little broth or water to loosen it back up upon reheating. If you try it, let me know how it turns out. And I’ll do the same next time I make it. This soup looks so rich and creamy! Perfect for this chilly weather we’ve been having. Yes. It’s dropping into the 20’s the next few days. Brrrr! Definitely need some soup to warm me up! This sounds delicious! I love how many nutrient-dense whole foods you’ve smashed into the cheesy broth base. Looking at the photos I would have never guessed you used potatoes and squash in your recipe! I can’t wait to try it. Thanks, Amy! Butternut squash is my go-to for cheesiness! 🙂 I hope you love it! “broccoli with an overabundance of cheese sauce…” haha! This definitely sounds like my kind of soup! This looks great and I can’t wait to give it a try. Thank you, Rebecca! I hope you love it! I want to dive face first into a bowl of this!!!! YUM!! 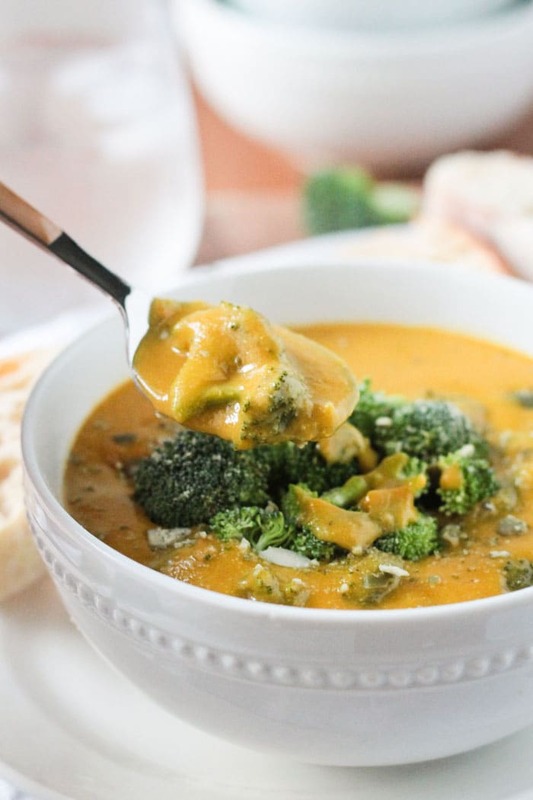 Broccoli cheese soup is a favorite of mine and this looks amazing! I remember you mentioning before that you’re not a fan of nutritional yeast so I was really excited to see how you made it “cheesy.” I’m not a fan of overly noochy flavored sauces/soups, so I was happy to see it used as an accent and not the main cheesy source. 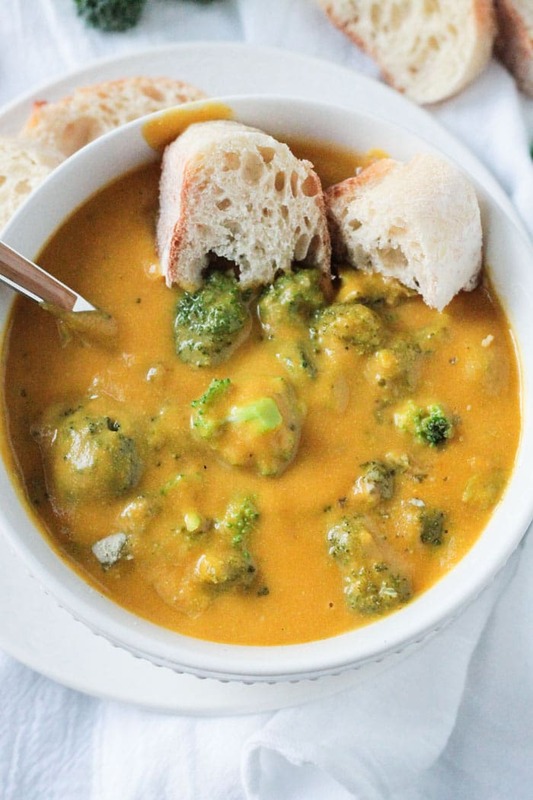 I love that you tweaked your butternut mac recipe to create this creamy soup! Looks so thick and comforting…how soup should be ? Thank you, Mandy! Yeah, definitely don’t love the sauces that rely only on nooch for the cheesiness. It complements the sauce really well here, but it’s not necessary at all. I hope you guys love it! We have a pasta recipe where we use butternut squash for a cheese sauce, but never thought of trying it as a “cheesy” soup! Love it! If you love it in pasta, I think you will love it in soup, Maria! Enjoy!! This looks amazing! I absolutely love the big chunks of broccoli and texture, I bet it tastes as good as it looks! Thanks, Sarah! It was definitely a huge hit in this house!